"This is about a paradigm shift in our approach to education." 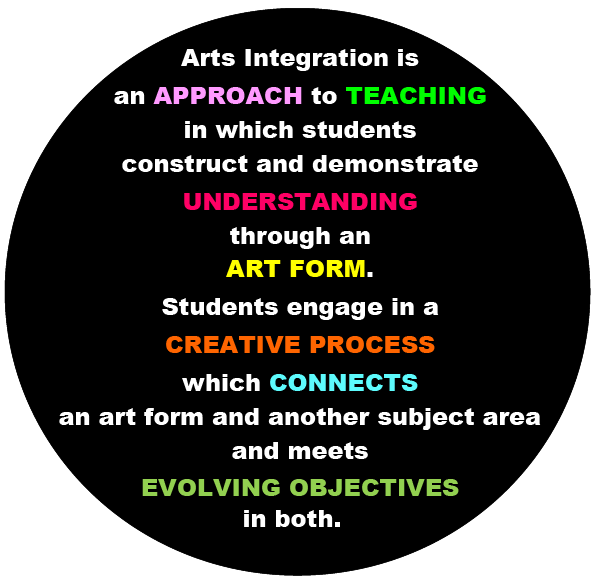 Arts integration is an approach to learning in which standards based objectives from the visual and performing arts (the visual arts, music, dance, theatre and media arts) and one or more other subject areas are aligned, met, and assessed. It is important to know that arts integration does not supplant single subject art classes like band, dance, drama or drawing, but instead is used to design robust lessons that engage students in the processes used in the arts, such as creative thinking and active learning. Done with diligence and purpose, arts integration helps students flourish, deepen their learning, and make meaningful connections between the disciplines. Studies have shown that art experiences result increased academic achievement, self-confidence, motivation, and improved social-emotional connections and behavior. Pathways for learning in other areas are made available to all students using the arts. Access to the curriculum is facilitated, offering a nonverbal means of communication for students who are at various places in their language development. Students with special needs have greater opportunities to meet learning challenges when activities include art experiences and build skills that other approaches cannot. Equity and access to learning can be facilitated with the arts. "Arts are a natural bridge for children with differing abilities, including special needs, gifted and talented, and all kinds of exceptionalities. Every child offers a unique contribution to your class and every child has strengths and needs." Connections are found everywhere. Links between the performing arts and physical education are numerous and boost the level of engagement for many students. Dance and music can be combined with movement in ways that allow students with a wide range of abilities to be successful, leading to increased self-confidence. Integrating the arts with co-curricular subjects allows students to experience learning directly rather than through passive means such as videos and lecture. Many of the process skills used in the arts – especially higher order thinking skills – are used throughout all academic areas, including math, English, science, social studies and the social sciences, and these common characteristics bridge disciplines in ways that go beyond content. Arts integrated experiences develop the 21st century skills known as the Four Cs -- critical thinking, communication, collaboration, and creativity, essential skills for students to have in school, career, and life. The inclusion of the visual and performing arts in the elementary curriculum is traditionally done in a variety of ways. Creative teachers have always developed engaging activities to accompany academic content. Role-playing may be used with studies of famous historical characters and colorful models of the planets and solar system are often made in science. Music and dance are joyful, indispensable parts of cultural and seasonal activities. While these activities enhance learning and encourage creativity, they are not arts integrated lessons. Intentional and purposeful arts integration positions the arts as essential learning, using measurable learning objectives and addressing standards from the arts that align and have equal importance with those of another content area. The Kennedy Center for the Performing Arts offers a definition of arts integration, a result of their effort to clarify and create a useful description of what constituted quality arts integration. For any teaching and learning practice to become systemic and influence a school or district’s culture, working together and moving forward despite challenges and uncertainty is imperative. Middle school dance teacher Debra Kapp has her students use dance to explore the elements of air, fire, water, and earth. Students use their knowledge of legends when expressing one of the elements. Students work together to choreograph and perform dances while Debra stops students regularly to reflect. Arts Integration changing the way students learn, for the better. A succinct description of what arts integration looks like is found on the ArtsEdge “Arts Integration Checklist”. It is built upon the Kennedy Center definition of Arts Integration.